Mondays at 10:30 a.m. at the CMBA Office beginning September 10, 2018. Lunch is served afterwards. This will be a once a month round table. Come and share your ministry successes, and failures, or just to get ideas. You will find friendship, partnerships, encouragement and information to help you in your ministry to youth. We will meet over lunch on the first Thursday of the month. Bring all of your VBS workers regardless of the literature you are using. It is our desire to help you to have the best VBS possible and reach children for Christ. 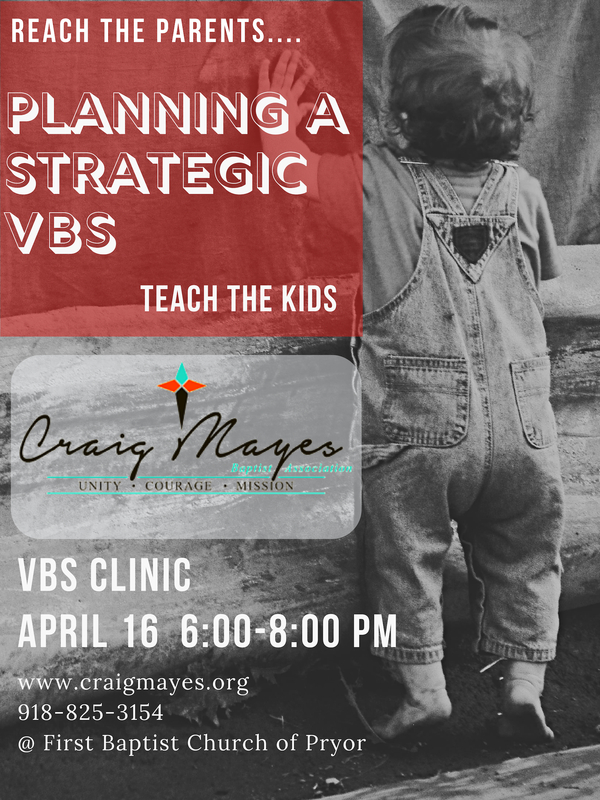 This clinic will help you focus your efforts to actually reach lost children and connect them to the message of Christ. We have moved our quarterly meetings back to Monday mornings. Please make every effort to attend so we will be able to accomplish the business of the association. The next CMBA Board of Directors' Meeting will be on May 20, 10:30 am at the CMBA office. This is our yearly meeting. Please inform your messengers about the meeting. We will have business to approve for your association. This also counts as one of our quarterly board meetings. Time: 6:30 pm for Praise and Worship with business to follow. Lite snacks afterwards. Edmonton is a partnership mission city with the Baptist General Convention of Oklahoma. Next trip is planned tentatively for February 26- March 3, 2019. If you are interested in going, check with Bro. Dan about upcoming trips to Edmonton at dan@craigmayes.org. Check back later in the summer for information about the 2019 SYATP event. This will be a come and go fellowship with finger foods, and other Christmas treats. Bring a gift for our church planters to Northern Colorado to help launch their ministry. (kids craft items, stamps, envelopes, Dayspring greeting cards, coffee, tea, creamer, sweetner packets, hot chocolate, pens, journals, and devotional books just to name a few). A great time was had by all. We were encouraged to be evangelists as God has called each of us to be. Share the Good News of Jesus! August 4-August 8, 2018 - POSTPONED - Be watching for more information and scheduling. If you are the youth minister/leader for your church, you will want to mark these dates on your calendar. Come and be encouraged, empowered, and engage in your association to reach youth for Christ. Contact Bro. Dan if interested on going on this retreat. Time for a road trip! More information to come.